HR Transformation is written by the leaders of the RBL Group. For those not familiar with them, they are viewed by many as the people setting the yardstick for HR. HR Transformation focuses on how HR can, and needs to, be aligned with an organization's overall business strategy. As they say, how HR can adopt an outside-in focus to their strategy. If HR strategy is not aligned with the overall business strategy, the chance to succeed is significantly reduced. Rather than seeing just the organization as HR's stakeholders, the stakeholders of the organization in generel needs to be taken into account. When HR initiates something, this initiative needs to answer a stakeholder's need first, like a customer. A leadership training programme should be initiated because by doing so will gain the customers (or clients, patients, etc.) that depend on the organization. This is thinking outside-in. 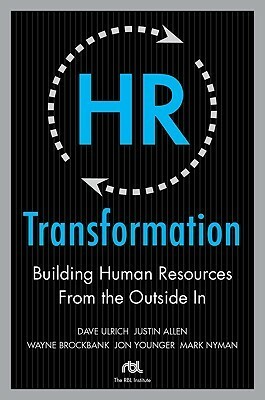 The book looks at the transformation process through four phases: Business context, outcomes, HR redesign, and HR accountability. It also offers case examples from some of the RBL Group's clients that have gone though HR transformation processes. If you work with HR, this book, and knowledge of the RBL Group, is essential. They are at the forefront of HR development. Having had the pleasure of attending a workshop with Jon Younger (co-author of this book) on talent management, I can safely say that they know very well what they are talking about. Their work is highly recommended. My 5th choice for a book to satisfy SPHR Re-cert credits. I was impressed by the resources that these authors made available for implementing their ideas, which can be found at www.hrtransformation.com. The basic premise of the ideas in this book is that HR needs to be more strategic, and less transactional, and a good case for outsourcing transactional HR roles is made, to demonstrate how time cane be freed up to allow HR professionals to be more strategic business partners. In the digital age, clearly some of the concepts in this book are starting to look dated. However, for a relative novice in the HR domain, this might still be worth a read. An HR professionals guide book, as far as I am concerned.